“Big Muddy” Mike Clark is one of the most accomplished canoeists and guides in America. He has over 10,000 miles of big river experience and has led large and small groups on the Mississippi and Missouri rivers since 2001. BMA is a licensed and insured river guiding business and operates as an affiliate of Quapaw Canoe Company. 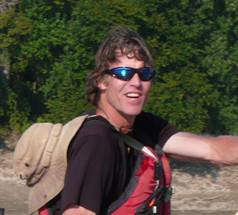 Mike conducts live learning adventures for school children across North America -- connecting our youth with our rivers. He also teaches computer lab, science & history at St. Anne’s of Normandy, an inner city Catholic School in North St. Louis. Mike Clark is a youth leader and truly a Champion of America’s Rivers. If you are interested in paddling & experiencing any of the great rivers around St. Louis, you will want to contact Mike to set up a custom-guided adventure with the man who knows those rivers better than any one else! St. Louis is the center of a giant wheel of rivers that come flowing in from all directions, connecting America’s cultures, history & geography like no other single location.Mike conducts day trips, learning adventures and extended expeditions on the Lower Missouri River, the Middle Mississippi (St. Louis to Cairo, Illinois) the Lower Illinois and the last section of the Upper Mississippi. Contact Big Muddy Mike directly to arrange your adventure in the heart of America at mike@2muddy.com or visit website www.2muddy.com for more information.